Do You Really Need to Find Her? I will preface this that you don't have to find the queen every time you look in the hive. If there is open brood then there was a queen at least a few days ago. But there are situations where you really need to find the queen. Requeening being the most likely. So here are a few tips. First, don't smoke them very much, if at all, or the queen will run and there is no telling where she will be. 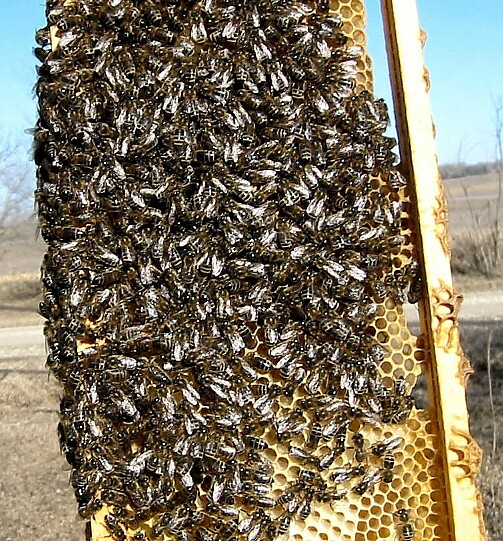 The queen is usually on the frame of the brood chamber that has the most bees. This isn't always true, but if you start on that frame and work your way from there you will find her either on that frame or the next 90% of the time. The bees are calmer near the queen. Of course the obvious thing is that the queen is larger, and especially that her abdomen is longer, but that isn't always easy to see when there are bees climbing all over her. Look for the larger "shoulders" The width of her back, that little bare patch on the thorax. These are all larger and often you get a peek at them under the other bees. Also the longer abdomen sticking out sometimes when you can't see the rest of her. Don't count on your marked queen still being there and being marked. Remember they may have swarmed and you didn't catch it or they may have superseded and she may be gone. Look at how the bees act around the queen. Often there are several, not all, but several bees facing her. The bees around the queen act different. If you watch them every time you find a queen you'll start noticing how they act, and how they move different around her. Other bees are either moving quickly or just hanging and not moving. The workers move like they're listening to Aerosmith. The queen moves like she's listening to Schubert or Brahms. She moves slowly and gracefully. It's like she's waltzing and the workers are doing the bossanova. Next time you spot the queen notice how the bees in general move, how the bees around her move and how she moves. Usually the queen is slightly different color. I have not found this helpful because she's also usually close enough in color that she's still hard to spot by this. Also, mental attitude makes a difference when trying to find anything from your car keys to hunting deer to finding a queen. As long as you are doing cursory looks thinking it won't be there you won't find it. You have to believe that the keys, or the deer or the queen is there. That you are looking right at it and you just have to see it. And then suddenly you do. You have to convince yourself that it is there and convince yourself that you will find it. I don't know how to explain it well enough, but you have to learn to think like that. 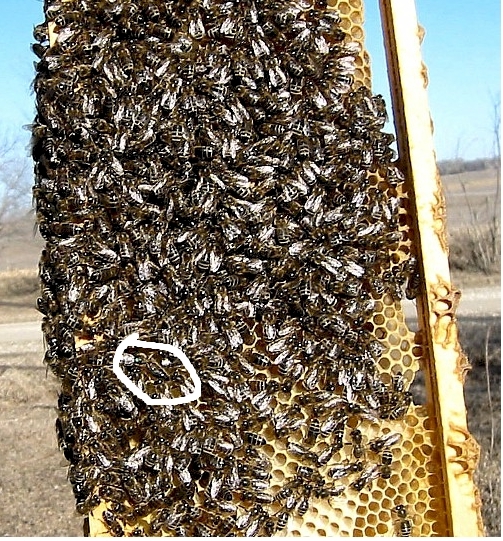 Of course the best solution to learning to find a queen is an observation hive. You can find one every morning when you get up, every evening when you get home, and every night before you go to bed and not disrupt them at all. It still doesn't give you the practice at finding the right frame on the first try or two, but does help you with spotting her. Having the queen marked in the observation hive is nice for showing the queen to visitors, but NOT having her marked works better for practicing finding the queen. Even if you buy all your queens marked you will often be finding an unmarked supersedure queen.